Are Advertisements The Only Way A Website Makes Money? To most people, making money online is mostly about advertising on your blog or website. Advertisements can be of various form, including direct ads, affiliate ads, sponsored ads, and so on. While advertising remains one of the most popular and lucrative forms of online earning, it is not the only one. 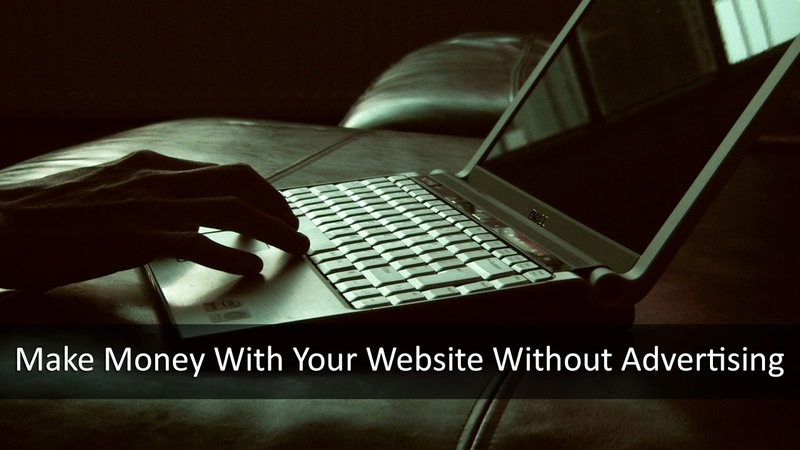 If you don't want to clutter up your website with all those ads, and prefer to keep things minimalistic, then you can consider other ways of making money with your website. Paid reviews are a very common method of making money. Authoritative websites, or websites focused on a particular niche get paid to review certain website, app or web service. If you have a website with a decent traffic, you can contact a review network too and get paid for writing reviews on your website. Some of these networks include PayPerPost, ReviewMe, and BlogVertise etc. Affiliate marketing is a form of advertisement, but not if you do it properly. Instead of just stamping an affiliate ad in your website's sidebar, it's far more important to actually create content about the product you're advocating. People write reviews, comparisons, rounds ups, and so on about the affiliate products they want to sell on their blog. Offering your expert services in the form of consultation to clients who pay you is another form of making money online. MBT has its own services page, where you can get in touch and hire us for our professional services. If you're a developer, you can showcase the software and tools you've created on your website to make money. Some people offer free tools on their sites (just like we do here at MBT - click here for our collection of Blogger resources). You can offer trials, with option for users to buy the full versions of your software. These tools can be anything from Blogger widgets to WordPress plugins. There's another source of income you might have overlooked. If you're good at tweaking templates and themes, you can create your own and sell them. Bloggers are always looking for new themes or templates for their blogs, which is why some people, such as Brian Gardner from StudioPress, have made a fortune developing and selling templates. There are services that will pay you money to run a small survey or poll on your website. The most popular one is called Vizu Answers. Basically you need to sign up with them, and select the kind of polls that you want to run your site. Most of these services operate under a CPM model. If you have sound knowledge of a particular subject, why not use it? You can build an eBook on it, and then sell it for a profit! Check out our post on building an eBook delivery system, complete with an auto-responder. Almost every pro-blogger has used this technique to make some money. I hope things don't come to this, but if you're really doing some community work, or developing an open-source software, you can ask people for donations to fund your project. I wouldn't put it down as a profitable endeavour though. There are certain moral obligations associated with taking donations from the public - learn and understand them. Another very profitable business model is making and selling websites. Good domain names themselves go for 6+ figures. And developing websites can further add value. And if you have a well established blog or website, you can sell it for much more. Quasim bro, awesome work. I am reading one of your posts after a long time, to be honest it was may fault ofcourse,means was a bit busy. But as Always, whenever i get tired ot Demotivated from mah blogs, MBT works like charm for meh, you know like after reading any single post i feel like Running and start writing on mah blog hahah :) Anyway great info. Yeah just one query, can i get the codes of the SERVICES tab, i mean the tab just above the comment box? Or something similar to put on mah blog bro? It's nice of you to return to our blog after some time, so welcome back :). We try our best to motivate people, and every time someone tells me they feel motivated after reading our posts, we are genuinely pleased. We're happy to help in any way that we can. So thank you for appreciating our work. Need suggestion about blog traffic. I am tried but still against get no response. already done SEO. Nice article but ads are most useful if someone just want to make money while reading and writing his interest on web ! Thanks for doing suuport and motivate to bloggers. I am a new blogger trying to be a good earner via my blog. Great article Qasim, it could be really frustrating when you putting the work and not seeing anything but like you said it requires patience.... Well done.. I am really very impressed with the information provided in your website. My query is that is there any way for qualifying for adsense for my new blog "surveypool.blogspot.in" without having a website or any other way of generating income from it without spending any money.